Welcome to January! 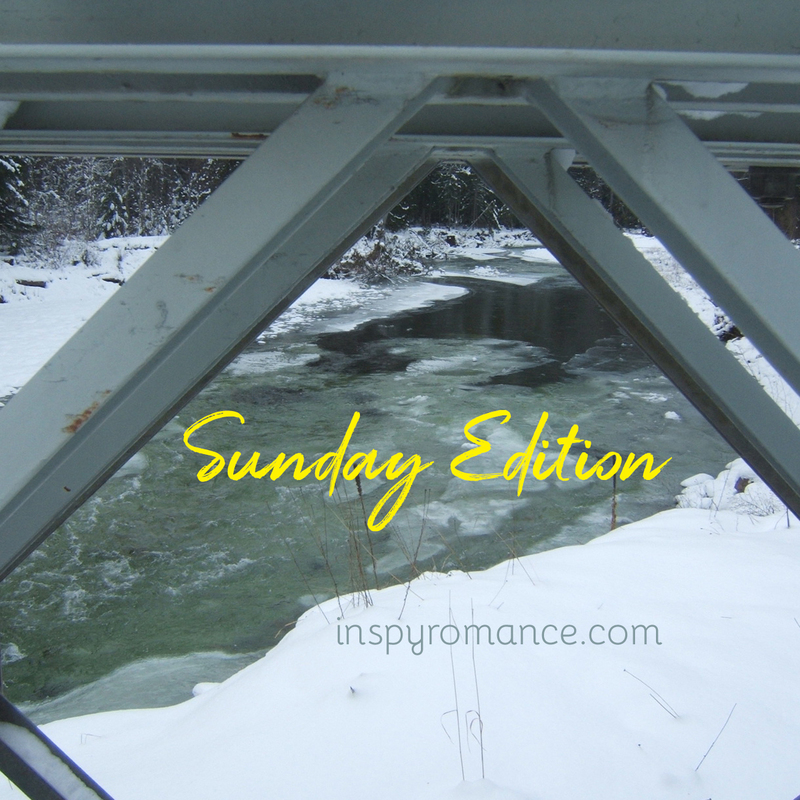 Over the next few weeks’ worth of Sunday Editions, I’ll be sharing winter photos of my part of the world (southeastern British Columbia, Canada). This one is of a bridge in a park nearby where we hike in the summer and snowshoe in winter. Some years we don’t have a lot of snow — looks like 2019 will be one of those since we had more rain than snow over NY week! But no one wants to see photos of a dismal, gray, cold January, so you get snow photos instead! Carol Moncado’s winner is Diana! Jackie Castle’s winner is Priscila! December gift card winners are Ausjenny and Christie! On Monday, Janet W. Ferguson interviewed Becky Wade — Book of the Year! …and #giveaway. On Tuesday, we were closed for New Year’s Day! On Wednesday, Cecelia Dowdy rejoiced in unexpected blessings. On Thursday, Ginger Solomon announced a new year, a new me. On Friday, Krista Phillips confessed to battling settings unknown. On Saturday, Julie Arduini mused on the way to a reader’s heart. 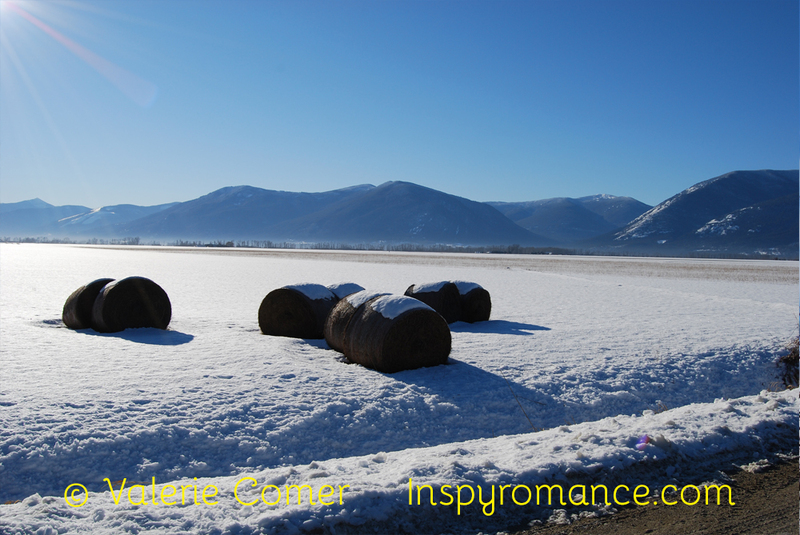 Hi Valerie, I love the photo of the hay bales in snow- great photo! I have never snowshoed before- the boys are completely hooked on cross country skiing so we tend to do that as often as we can in winter. Some time, we will have to give snow shoes a go! We used to cross-country ski but have found we enjoy snowshoeing more. You don’t need to stick to a track for ease and you don’t get to glide… but you do get to cut your own trail and explore. Plus, it’s easier on my shoulders! Hi Valerie and Happy New Year! Thanks for sharing. 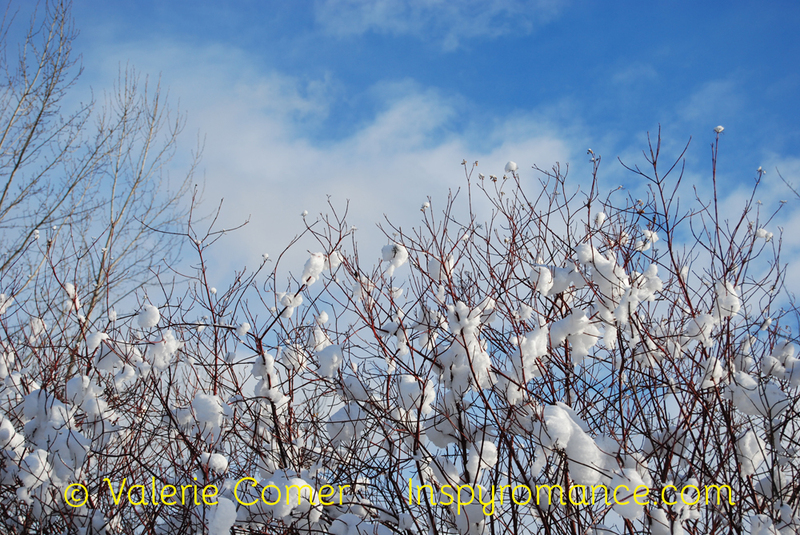 Love the snow caught in the dogwood. The Midwest is also experiencing a mild winter with more rain than snow. Most days are temperatures are above freezing. Yesterday was sunny and mild with temperatures close to 50 or 10 degrees Celsius. Enjoy your Sunday. Best wishes. Happy New Year! Here our winter forecast is for mild and wet, which means our passes will be way deep in snow while it’s gray and rainy in the valley. We NEED the moisture every winter to help keep the forests from getting tinder dry, but honestly, I’d rather look at white snow out my window than gray/brown mud! Haha, I haven’t “given up” on snow. Our winter forecast is for mild and wet, which generally means more rain than snow. The past few years, February – March has been our snowiest time. I enjoyed your snow pictures. In California we are thanking the Lord for rain! Oh, wow, I’m sure you are thankful, after the autumn you’ve had there! I enjoyed your photos. I live in Texas, so it is a rarity to get snow. Thanks! I don’t generally associate Texas with snow, but I’ve found it interesting that many Christmas novels set there include an unusual snowstorm! Can you imagine we have no snow here in NY.. its been a weird winter here for sure, so I enjoyed your pictures as well and I need to come over to inspy more often and have a good read. Thanks for sharing Valerie. I’m glad you came by, Linda! Thanks so much for my prize. I was in city for a wedding and got back exhausted hence the late reply. thanks. Congrats! I hope the wedding was beautiful.